Our "Addressing the Mail" eBook was created by The Berkshire Company as a resource for your organization. 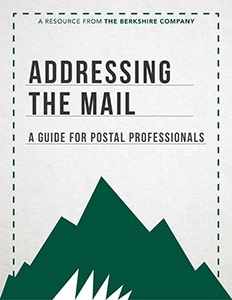 Addressing the Mail: A Guide for Postal Professionals is a valuable tool to help your company produce documents with the correct address, that the document goes into the correct envelope, and the mailpiece is delivered by the US Postal Service at the correct time. Please complete the form at the right to receive your copy.